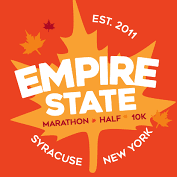 The annual Empire State Marathon and Half Marathon will include runners from over 35 states and 9 countries. The course continues to feature Onondaga Lake Park, Onondaga County, Syracuse, Liverpool, and Baldwinsville, New York. Date subject to change.